Rewind to around four months ago and you may recall The Teapot Chronicles . I'm sure you will be immensely relieved to discover that the teapot is still here and even more marvellous is the news that so is It's lid, here that is, unlike my sanity but that is somewhat of a no brainer (a bit like The Husband). I'm still rather plagued with the psychosis of ensuring each evening all pieces are present and accounted for and safely in their carry case where they should be. The carry case that is cruelly partially transparent which only serves to make it all the easier to torment me when pieces go awry. Unfortunately there have been several spoons missing in action, presumed dead, yet the 'there is no spoon'mantra has so far prevented me from clawing at the paintwork and ripping up the carpet to find them. If I try incredibly hard and self medicate with copious amounts of chocolate I can temporarily suspend all belief that four spoons existed let alone any notions that they may be indeed necessary.Temporarily. 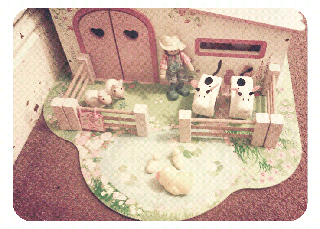 Recently Thing Two rediscovered the rather charming farm she received from My Mother several Christmas' ago. It's the rather sweet Rosebud Farm from The Early Learning Centre which I try so very hard to adore yet I can't help but be aggravated by the shocking lack of pigs, I mean really....a farm without pigs? Not to mention the absurd presence of ducklings yet no duck and a cockeral and no hens! How bloody negligent of them! Then there is the horse that looks suspiciously like a giraffe, Yes, on a farm. 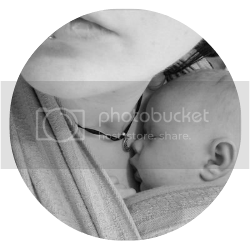 Irregardless of It's misdemeanors it is awfully cute and yet I can count on one hand the amount of times Thing Two has bothered with It. 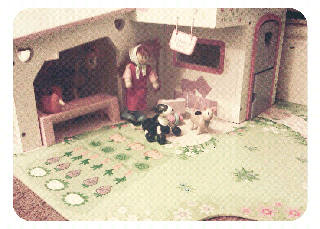 She simply doesn't 'do' that kind of play as the ignored dolls house will attest to. She appears utterly appalled by the idea of having to set things up. Until recently that is, when The Husband gutted tidied her pit room. 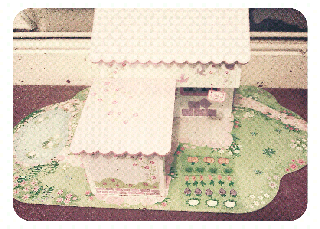 Suddenly she sparked an interest in it and sneaked the buggery thing downstairs much to The Toddlers sheer delight. 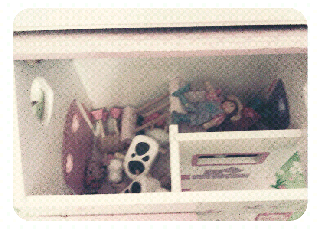 You see, The Toddler is a real Toddler who actually plays with such things and remarkably enjoys them too. He is deliriously attached to the two cows and goes on these barmy quaint psychotic rampages with them shouting 'Moo Moo Moo' incessantly. Yet Houston, we have a problem. 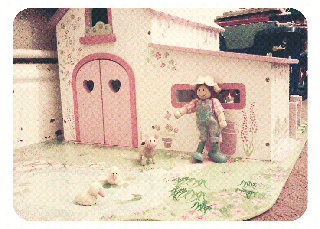 The farm consists of pieces. Multiple pieces. Multiple necessary pieces. Vital pieces that are intrinsic to our very existence and should one go AWOL it would render the play farm experience as we know it ruined for ever more. Just thinking about this is tumulting me into a twitchy state of panic. Every night at tidy up time I have to launch a full scale animal search and rescue mission enlisting Thing One and Thing Two who usually find many of the animals in The Toddlers oven, roast beef anyone? I try to remain ambivalent for to reveal the true extent of my frantic anxiety only makes the animals hide harder. Gits. It doesn't stop there though. Seriously. It gets worse. The level to which my scantily clad sanity stoops knows no bounds. The pieces have to be arranged. Yes. What's worse is that I actually have a small perverse pleasure in doing this, It's immensely satisfying for the soul. 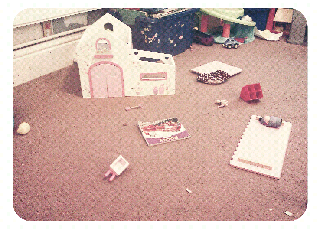 Everytime The Toddler or Thing Two desecrate and pillage one of my lovingly arranged scenes a voice inside of me cries. A lot. Because quite frankly It's not bloody fair and really rather mean of them! I tried changing tactics and tucked all the pieces up safe and sound for the night inside the farm, but it just wasn't the same. It didn't feel right. So I waited until their bath was ready and secretly rearranged them. The nightly tidy up is about to commence. 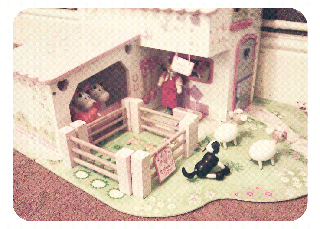 The farm and teaset are both strewn across the room.